Note: Please note that this tutorial is for WRL-15006 . 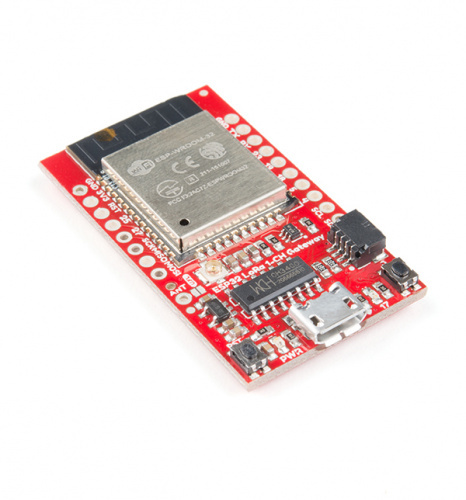 If you are using this with the older version [SPX-14893], please refer to the ESP32 LoRa 1-CH Gateway, LoRaWAN, and the Things Network tutorial. So you've designed an automatic shepherding robot but you still have to go out to the field to make sure it is working? Worry no more, you can use long-range radio to keep tabs on that 'bot through the internet of things! All you need is an interpreter to speak the language, and the LoRa Gateway 1-Channel does just that. The LoRa Gateway 1-Channel is a monster 3-network capable device thanks to an ESP32 module and a RFM95W LoRa modem. The RFM95W handles the 915 MHz band while the ESP32 takes care of bluetooth and WiFi. One of the ideal uses is to convert LoRa (Long Range) radio messages into data packets that you can access via the web, but of course the flexibility it offers can be put to many more uses! This guide will go over the hardware on the board, how to program it in Arduino, how to create a single channel LoRa gateway, and finally how to create a LoRa device on The Things Network. The LoRa Gateway 1-Channel can act as either a gateway or a device, but not both at the same time. To really be sure that your setup works as expected you should have another LoRa device to listen to, and/or another LoRa gateway to transmit to. The good news is that the LoRa Gateway 1-Channel can act as both so if you have two then you're all set. To program the LoRa Gateway 1-Channel you will need a micro-B USB cable and a computer with the Arduino IDE installed. If you want to make a permanent installation away from your computer then consider powering it with a USB wall adapter or USB battery pack. To use the 915 MHz radio on the gateway you will need an antenna - for which you have two choices. You may cut a length of solid-core wire to approx 3" or use a 915 MHz antenna with a U.FL connector. If you choose the wire route then you will also need a soldering iron and tools to attach your antenna to the board.